One of W. Edwards Deming‘s great accomplishments was his creation of the “System of Profound Knowledge” (read more details here). 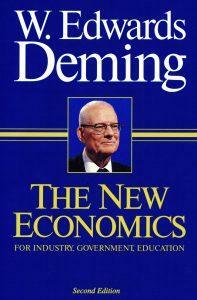 The System of Profound Knowledge (SoPK) is described in Deming’s book, The New Economics. In its most basic terms, SoPK is a framework designed to enable progress in the practice of management, and hence progress in business, organizations, and society. Deming recognized that the classical ways in which organizations are led and managed are archaic, bad for business, bad for people, and unable to keep up with the times. So he developed a framework, which, if adopted and practiced diligently by leaders, would transform organizations and result in better outcomes. SoPK was based on a combination of careful observation of the better-led and better-managed organizations, and precise, logical deductions of the thinking and practices that are effective (or ineffective). It is based on a systems-view of people and processes. As is well-known by many, Toyota’s management system (TMS), and its derivative, Lean management (LM), is also based on a systems-view of people and processes. Deming’s SoPK, TMS, and LM all share similar characteristics in terms of laying the groundwork, in mindset, rules, and methods, for making sustained progress – i.e. to continuously improve, and do so in ways that respect humans, develop their capabilities, and which cause no harm. 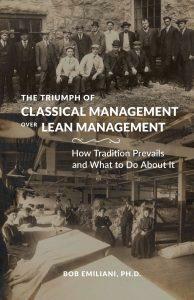 SoPK, TMS, and LM are forms of progressive management have been around for 30 or more years. These are wonderful, practical improvements to archaic classical management; so good, in fact, that they are worthy of replacing classical management in its entirety. Such transformations have proven to be exceedingly rare, driven by the choices made by a few brave CEOs determined to lead and manage organizations differently than is usual. We are fortunate to have some good examples of transformed businesses that indisputably validate the work of Deming and others. But, as you will learn below, these wonderful examples (e.g. Toyota, Wiremold, Virginia Mason, etc.) are closer to a few happy accidents than they are to overturning the status quo. The questions is, why hasn’t SoPK, TMS, and LM overtaken the inferior (classical) approach to leadership and management on a much broader scale? Unfortunately, the speculations and commonplace insights proffered over the decades have done nothing to satisfactorily answer this tremendously important question. Said another way, why is the status quo (classical management) preferred so much more than progress (progressive management)? What has been missing is a detailed analysis of the antithesis of SoPK. My new book, The Triumph of Classical Management, identifies a countervailing force that successfully obstructs SoPK (and TMS, and LM), and therefore progress: “System of Profound Privilege” (SoPP). It illuminates the nature of the status quo, much preferred by leaders, in comprehensive and uncomfortable detail. Specifically, it examines the interconnected and interdependent economic, social, political, historical, philosophical, legal, and business factors that has cemented the status quo and thus retards progress – progress that is much need, if for no other reasons than times change and humans evolve. Over time, people expect better in every aspect of their work and life. They expect to move forward, not backwards, and expect their children to be better off than they were. This is a fundamental aspect of human existence; hope and belief in a better future, minimally tainted by the whims of our leaders who stand above us. Yet, the two systems, SoPK and SoPP, are profoundly antagonistic. They work against one another, and SoPP has vast superpowers over SoPK. That is why Deming’s vision of leadership and management, TMS, and LM have been so difficult to realize in practice, to make things better for people, in work and in life. Transformation from classical management to SoPK, TMS, or LM are rare because they disrespect the rights and privileges of leaders, which generates potent, though usually silent, opposition. Furthermore, many aspects of SoPP were enshrined into law (e.g. Natural Rights, property rights, ownership, free markets) and codified in policy long ago, and thus SoPP has become deeply embedded in the common sense of the population. As a result, SoPK (TMS and LM as well) will almost always be the loser in the competition between these two profound systems. To borrow a recently popular phrase, “the system is rigged” against SoPK, TMS, and Lean. So how do we make greater progress than that we have experienced thus far? One option is to wait. We can wait for generational changes in leadership; people with different views of what constitute good leadership and good management, to drive the needed transformation in management practice. But we have been waiting more than 100 years for that, and the utility of SoPP seems far from being exhausted. Though, it is possible we could now be witnessing the beginnings of a generational change in leadership. However, don’t ever discount the power, determination, and effectiveness of arguments made by those who wish to prevent transformation or revert back to the status quo after transformation has been made. A better option is to learn – rapidly. Change will begin to come about when both systems, SoPk and SoPP are recognized and understood. SoPK, TMS, and LM – the future state – are recognized and understood well-enough. What is not recognized or understood well enough is SoPP – the current state – and this lack of understanding has rendered the solutions to better management, SoPK, TMS, and LM, ineffective in producing the needed change. So, begin to understand SoPP, its scope and depth, by reading my book. The second step is to identify practical countermeasures, some of which are provided in the book, others you can think of yourself. The third step is to try the countermeasures, learn what happens, make adjustments, and try again. And keep trying. In other words, follow the PDCA cycle and don’t give up. That is what progressive management – SoPK, TMS, and LM – is trying help bring about. SoPP prevents that. Bob, I have always seen management resistance as a major challenge to the change process. Your SOPP – System Of Profound Privilege, gives us a word for part of that problem. Below is the story of my own experiences of overcoming this challenge. Engaging the management team is without doubt the most difficult element in the process of introducing TPS/Lean. I did not fully understand this myself for the first five years of my own TPS journey. On my early visits to Japan in the late 1980’s and early 1990’s, I had seen that TPS was designed to achieve three main flows. From the combination of these flows Toyota had generated a torrent of competitive advantage. 1) JIT/JIDOKA. The output of a smooth, defect & waste free flexible flow of existing & new products to customers. This must give them: what they want, when they want it, in the quantity they want. Your goal is to produce the best values of: Productivity, Quality, Cost (lowest ownership cost), Delivery (OTIF), & customer Delight in your industry. 2) TPM. The smooth flow of materials, products, information & services through our machinery, processes & systems. In this area the goal is to achieve Zero 5D’s. Zero – Downtime. (Unplanned). Zero – Delays. Zero – defects. Zero – Damage /Danger to people. 3) KAIZEN. The flow of our people’s talent, creativity & enthusiasm to drive the waste elimination & continuous improvement process. The goal in this area is to release & focus the total ability of all our people to achieve the goals in the first two areas. In the late 1980’s & early 1990’s, the tools & techniques I had learnt on my annual trips to Japan always worked, but we had difficulty sustaining the process. (Sounds familiar).What I had missed was the system for managing & sustaining the fourth flow, the flow of change itself. This is the main function & focus for the management team. Once we identified this missing element, we defined the skill set to give managers the 3 A’s, awareness, attitudes & abilities to do this. As there wasn’t a Toyota word for it, we called the material we created the Taozen system. 4) TAOZEN . This is the management system to identify, create & sustain the flow of the correct changes throughout the organisation. The central theme of Taozen is; ‘Star managers make their people shine.’ The role of the manger is not only to demonstrate their own ability, but more importantly to release, focus & support the ability (talent, creativity & enthusiasm) of the people they lead. The system also requires a fundamental change in attitude within the organisation. The traditional organisational structure has the directors at the apex of the pyramid, with everyone else beneath them. The Taozen system requires the pyramid to be inverted. Directors now support managers, who then support their people who will then identify & support the needs of their customers. Before we start a programme we insist the senior management team have two days to study this subject. This will give them a common understanding & vocabulary for their role in creating & sustaining the flow of the change process/environment to support the introduction of TPS. On the event we create a fishbone diagram showing the management actions/causes that will create the effect of, ‘Success for our company & our people’. Now we have agreed as a management team the behaviour we expect, we can coach to support it. Any managers who are unable to adopt this new style must be removed. Seeing some of the old abusers being removed is a wonderful signal to our people. Leaving them in place is an equally negative one. I find this concept of the four flows gives a clearer understanding of the overall process/nature of the TPS/Lean journey. It also helps everyone to understand their roles & goals to achieve it. The survival of your organisation depends upon improving these four flows & your Products, Services & customer Experiences (PSE) faster than any existing or future competitor. When you apply this thinking not only to your external & internal customer contact areas, but also down your supply chain, you will start to understand where & how Toyota’s amazing performance & competitive advantage is created. The vision we must share with our people is that our goal is to create an organisation that can compete successfully on the global battlefield, now & in the future, & is a secure, challenging, fulfilling, & enjoyable/fun place to work. – What is not to like? No brainer really! This model also gives a clear picture of the methods required for maximising supply chain effectiveness. Each company in the chain must manage the four flows and their PSE’s to the next chain member. They in turn will receive this from the previous chain member. All chain members have a common language for managing their activities. Hi Sid – Thank you for your comments. Fundamentally, it is a battle between the System of Profound Knowledge (SoPK) and the System of Profound Privilege (SoPP). SoPP has overwhelming advantage and usually defeats SoPK.